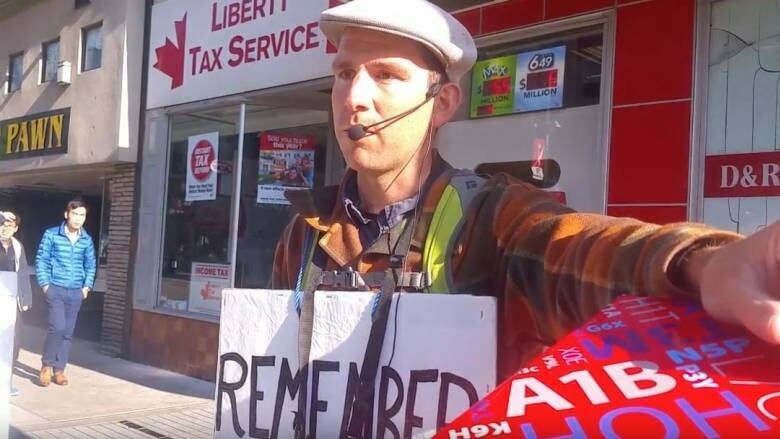 A timeline of the controversial actions of London, Ont., so-called street preachers Steven Ravbar and Matthew Carapella. The London Free Press publishes a profile of former Western University football star Matthew Carapella, who was 29 at the time. It tells of a young man who had it all: a good job with his family's condo development business Tricar, a penthouse apartment along with "money, parties, travel and women." But after waking up one day with a hangover, Carapella decided to give up his promiscuous ways and devote his life to God. "I'm going to go out and serve my Lord. I don't know how or in what way, but I know there's a calling in my life." The story also quotes Steven Ravbar, his Grade 7 teacher and "friend and fellow Christian." Ravbar and Carapella are often seen preaching on London's streets, in particular at the corner of Richmond and Dundas. They often use an amplified loudspeaker and wear sandwich board-style signs with biblical messages. In response to complaints about the men's behaviour, CBC London publishes the first in what would become a series of stories about the actions of Ravbar and Carapella. Everyone from police to church leaders say they are fed up with their confrontational style of street preaching. But CBC News also learns the men often disrupt services at various churches in London. Cory McKenna, a pastor at the Harvest Bible Chapel on Commissioners Road, is a guest on London Morning. He says he had to get a trespass order against the men after they confronted him following a Sunday service and harassed female parishioners about what they were wearing. He said the men "radiated a lot of anger" and called women in his church "whores". Women tell CBC News they are often told by Carapella and Ravbar they are dressed as whores. Specifically the men call out women for wearing a skirt or makeup, or having a short hair cut. One man told CBC News his wife was called a whore for wearing shorts. "It's almost laughable," he said. The story receives hundreds of comments and shares on CBC London's Facebook page as many members of the CBC London audience share similar stories. 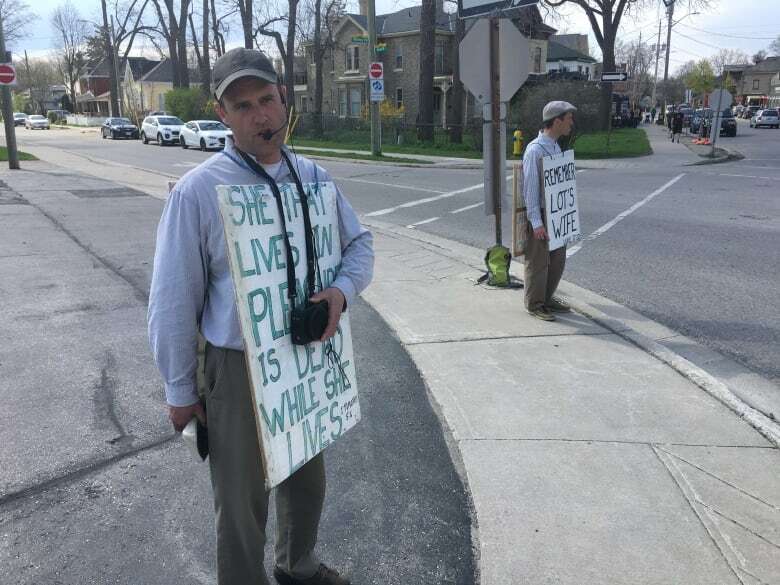 With complaints growing, London Mayor Matt Brown speaks out about the street preachers, saying their behaviour amounts to "gender discrimination" that "has no place in our community." Brown encourages anyone who feels harassed by the men to file complaints with the city's bylaw enforcement department. John Collins of Jeffersonville, Indiana, notices CBC's coverage of the story, including a video of the men preaching. He immediately recognizes it as a regurgitation of the sermons of William Branham, a U.S. preacher who died in 1965. Branham was a doomsday evangelist who led a movement called Latter Rain which deviated from mainstream Christianity. Collins grew up in a family inspired by Branham, and calls the group a "destructive cult" that finds new followers through audio files of Branham's sermons posted online. The group in recent years has come to be known as The Message. "The first sermon I heard by brother Branham, I rejoiced," Carapella told CBC News. "That's what I've been searching for my whole life." In his sermons, Branham said women should be kept inside the home and they should not pursue careers. He also said women should not dress in any way like a man. Collins wrote about the London street preachers on his website Seek Ye The Truth, where he posts research and stories about The Message. He also wrote a profile that documents Carapella's transition from football star to street preacher. Members of Carapella's family praise Collins's work, and say their son is in the clutches of a cult. They don't want to be quoted, but say they acknowledge Carapella's behaviour is unacceptable. They also say they've made unsuccessful efforts to get him to break free from street preaching. Through an access to information request, CBC News learns there have been 18 complaints to the city's bylaw enforcement office about the behaviour of Carapella and Ravbar since 2016. None of these complaints result in a fine, largely because most of those who complain are not willing to attend court. Ravbar and Carapella are arrested and charged after a confrontation at a church in Shreveport, La. During the trip, the men were asked to leave at least three churches in southern states. A sheriffs office in Oconee County issues a warning to area churches after the men were asked to leave the Tabernacle of The Lord church near Townville, S.C. A pastor at another South Carolina church tells a local news station the men shouted "vile things" at parishioners. Because the street preachers' behaviour falls into a legal grey area, London city council amends it public nuisance bylaw to explicitly ban "abusive and insulting" language in public spaces. Council is split on the issue. The new bylaw passes by a nine to six vote, with some councillors concerned it could stifle free speech and may not withstand a legal challenge. In response to complaints that now number more than 75 in 2019, Ravbar and Carapella are charged under London's amended public nuisance bylaw. The charges stem from five occurrences of street preaching. The maximum fine the men could face is $10,000. More legal trouble for the so-called street preachers, this time with charges of criminal mischief. Andrew Fullerton, minister at Elmwood Avenue Presbyterian Church, said the men called him an "imposter" and an "actor" after a service at the south London church. Police were called, Ravbar and Carapella left but were later arrested. They are due in court Monday, April 15, 2019 on the public nuisance charges. Their court date to face the criminal mischief charges is set for May 27.